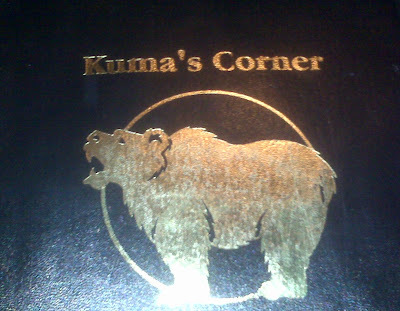 We went to go and try out Kuma's Corner. Our first attempt to eat here was foiled a few Friday night's ago (A wait of over two hours), so we said what they hay lets try on a week night. And boy I am sure glad we did. Kuma's is not fancy, it is not fine dining. But what it is...it is good, it is a bar with Jack and Jameson on TAP (yes, you read that right!) that happens to serve some killer burgers and some really good other stuff. This try we only waited about 15 minutes, almost snagged two stools a the bar (which is first come first serve) but alas no luck. While we waited I enjoyed the ambiance, I really like that small neighborhood feel, while sipping my Jack and coke. 1) We do not take reservations. 4) No Minors after 10pm. 5) Our kitchen is only 16×6. Please be patient. The Man and I decided to start off by splitting the Mac N' cheese (hey folks, don't judge - this is why I work out so much, so I can eat like a fat kid on occasion). The two toppings we choose were bacon and caramelized onions. Come'on Bacon, we think that is a silly question too! And for our burgers.... I went with the Iron Madien (same thing Lady Gaga got a week ago when she was eating here) and the Man got The Clutch. There were only about.. umm ALL of them I wanted to try! 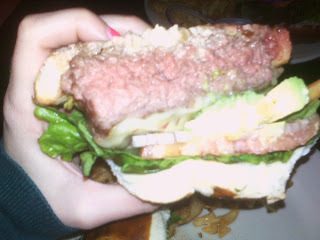 My burger was delish! Not to spicy, but with a tiny kick. The avocado cooled it right off. The Man described his as the perfect amount of cheese, not overwhelming but just right. The meat is suburb (good quality) and the pretzel roll bun YUM! We will surely be back!!! As much as I like trying new places, we normally go to a solid few over and over! Must go explore this city. Where is this place? I MUST GO! Have to add that place to my next trip to Chicago.